During a trip to Wisconsin in 2015, I ran out of deodorant. Thankfully, I was staying near a health food market and could easily stop by and pick some up — and that’s how I discovered Qet Botanicals. While the deodorant wasn’t a match for my body chemistry, this locally made find opened up a world of affordable, luxurious, natural beauty to me. Qet Botanicals makes some of the most lovely, non-pretentious, effective natural skincare that I’ve ever experienced. It’s priced within reason, which I deeply respect, and is formulated with high quality, organic ingredients that benefit the skin. I have many favorites in the Qet collection (this and this to start) and am eager to watch how this brand grows. Reading Lisa’s story-based approach to my request to be featured as a natural beauty buff has me even more excited for what she has to offer to the green beauty world. 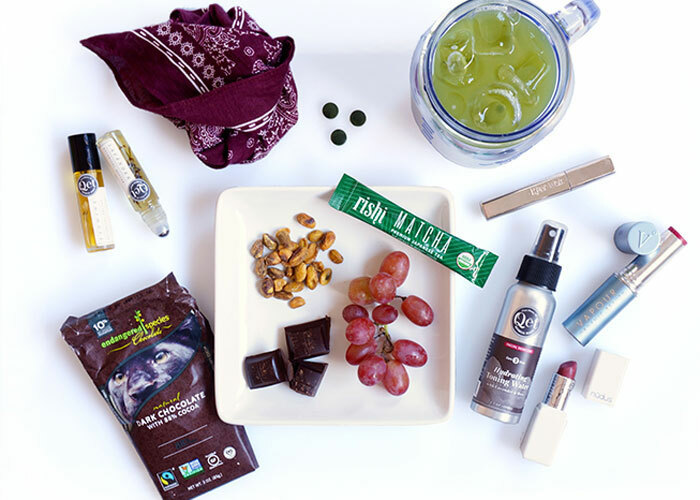 Green beauty and good skincare is more than just fabulous, well-curated and expertly applied makeup. It’s comprised of the actions we take, the food we eat and the thoughts that we think. It’s all about the day-to-day habits that affect the big picture and those little details. Stress, sleep, food, work, our environment, hormones — everything around us can affect us which, in turn, can affect our skin. We make choices every day; choosing to love what we use, and also to use what we love … well, this is where the magic happens. 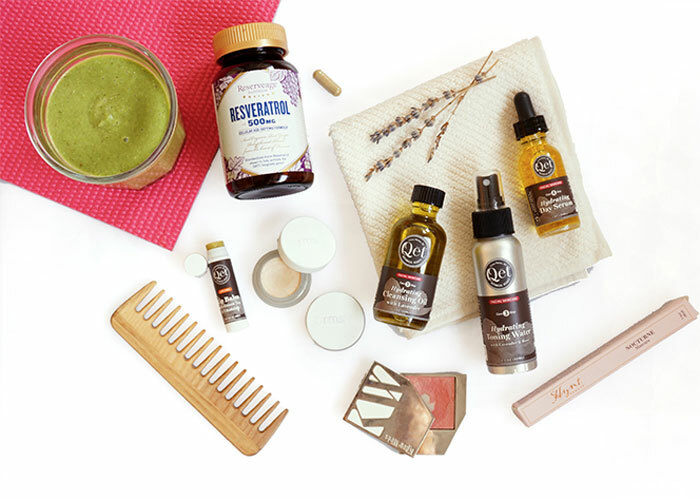 Here are some of my favorite things that I practice and use on a day-to-day basis. We all have a new start every day. On most days, I choose to get up just before 5 AM and practice yoga before our household stirs. If it doesn’t get done in the morning, it just doesn’t get done. My go-to yoga channels are Namaste TV and ZLiving. I’ve come to love this way of waking up. Also, being active outdoors, in the woods, in the water, on horseback… it all adds to the joy of experiencing new smells, adventures and challenges. This trickles into our everyday lives in different forms of happiness. Find your happiness. It matters. I start my day with a tall mug of warm lemon water with a morning probiotic. My happy intestine and gut health has helped to calm my rosacea. At the beginning of each new week, I make a week’s worth of green drink that I have for breakfast, usually with a slice or two of gluten-free Udi’s toast, Earth Balance spread and some raw cashew or almond butter (homemade or purchased). My favorite green drink organic additions are spinach, cucumber, avocado, cilantro, quinoa, coconut butter, local honey, lemon, cacao nibs, spirulina, flax and or chia, and berries. I’ve started taking a Resveratrol supplement once a day, as the benefits of grape seeds, their stems and the skins are wonderful for skin and organs. Our award-winning cleansing oil is a true pamper for clear or congested skin. Since we’ve launched, we’ve loved Coyuchi organic washcloths and include them in our Suite Accessory Kit. A sweep of Hydrating Toning Water with Lavender & Rose on a cotton ball ensures the proper pH and preps skin to receive the benefits of our Day Serum. No primer or other moisturizer is necessary before any makeup. We don’t formulate makeup, and I’ve had a hard time over the years finding something that was skin-friendly for me because of my sensitive skin and Rosacea. I’ve currently been loving RMS Beauty Un Cover-Up and their Living Luminizer for that after-yoga glow all day long. A dab of our lip balm goes on before any color. Many times, for convenience, I use a safe blush on my lips. I love the stay-on pigments in the Kjaer Weis Blossoming Blush. Hynt Beauty’s Nocturne Mascara is currently in my bag — it holds and feels lush. I’ve had this Italian Widu Comb for years, and I’m sure I will still have it and love for years to come. Handmade in Italy with a soft finish that doesn’t add static to the hair, it’s a wonderful scalp massager and stimulator to get the circulation going. We love it so much we sell the purse size in our natural Hair Essential Kit. I haven’t worn traditional perfumes in years. Because we work with botanical oils and natural aromas, I’ve become addicted to lovely, authentic, botanical scents. Before dressing in the morning, and mid-day, evening, and even before bed (ah, lavender) I roll on one, (or all!) of our Botanical Nectars. The Lavender and Jasmine Botanical Nectars lift me up if a pick-me-up is needed after lunch, and the Rosewood is grounding and intimate. It’s amazing how effective aromatherapy is for the mind and body. Just about every day, I drink a big mug of Rishi Matcha Tea with lemon and local honey, or warm with just almond milk (Matcha latte!). On the side, Endangered Species Dark Chocolate (88%? Yes, please!) is always within reach. Pistachios and organic grapes (the darker the better, and seeds are a bonus) are some of my favorite snacks. In my purse I carry a different set of on-the-go touch-ups: Kjaer Weis Mascara is refillable (brilliant); toning water to freshen the complexion; Vapour Beauty Torche, a cheery pink for cheeks or over lip balm; or Nudus 27 Kisses if I want a bit of a deeper color on lip or cheeks. A spirulina supplement is a wonderful green form of protein, a skin booster and can give an extra little energy perk in the afternoon. The benefits of its antioxidants for the skin are multiple. Adding a little splash of fun or color around your neck, or on your handbag, can add a little extra spiffiness should you need you feel it. I’m liking the smaller-sized pocket scarves and bandanas, like this one from J. Crew, for a little extra something that doesn’t overpower an outfit. A little reading, some soft, soothing scents and a comfortable bed and pajamas — there is no treat as beneficial for the mind, body, and skin as a good night’s sleep. Taking a warm shower before bed also raises the body temperature just enough to coo you into a restful sleep as your temperature settles again. A warm cup of lemon water, an evening primrose oil supplement (buh-bye, hormonal ups and downs), and the day is coming to a close. Simplifying the final moments with a page turning book and soft, organic sheets sets the tone for the night’s zzzzs. Ever since I can remember, I’ve washed my face, no exceptions!, every single night before bed. Even before I started to love makeup. Our Supple Eye Makeup Remover keeps lashes from breaking and is gentle enough for contact wearers (me!) and sensitive lashes (me, also). After washing with the Qet Hydrating Cleansing Oil, I use the toning floral water. Most nights I gently exfoliate with the Hydrating Exfoliant with Tea & Lavender or use a mask. The Life Changing Magic of Tidying Up has touched and positively improved both our home and my work life in many ways. 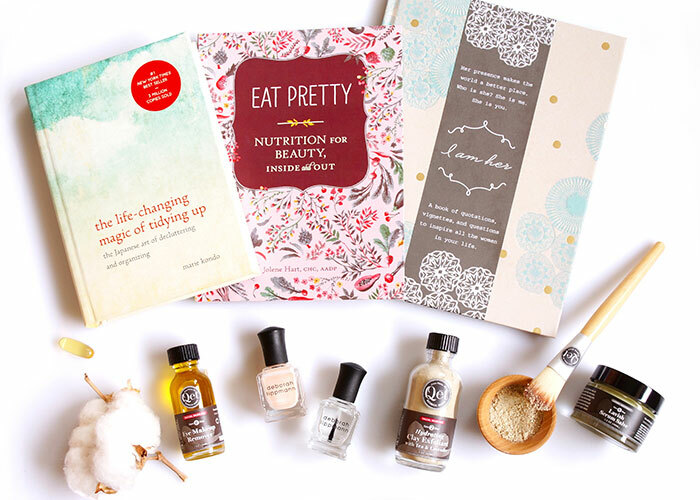 Another favorite to read and keep in the pantry is Eat Pretty. It’s not only informative, but it explains why certain foods are beauty foods. The included recipes are seasonal and delicious. My daughter and I received the journal I Am Her from a dear friend, and reading it is like getting a hug that really means something. Writing down our thoughts and expressing what we’re grateful for keeps us humble, thankful and not taking things for granted. For years I’ve worn just about the same natural polish color on my toes and fingertips, and I’ve always given myself my own manis and pedis. Deborah Lippman’s Baby Love is in my pouch. The polishes are 5-free, chic and stay fresh longer than many. Putting on a quick coat before I start to turn the pages is usually the only time I paint my nails. No sheet prints, please! After three drops of Restoring Night Serum and one drop of Hydra-Rose Eye Serum, I apply an extra layer of nourishment from our award-winning Lavish Serum Salve, on hands, around eyes, upper lip, on neck, décolleté, elbows, knees, and feet. That is the grand finale before slipping under the covers. Great skincare, which is not just about a product, can offer wonderful results without that clinical look or feel. Using safe, effective treatments should make us happy, feel good, and keep our minds at ease. Practicing self-care is not a luxury, it’s a necessity. Are there side effects to taking care of ourselves? You bet — and the beautiful side effects will be written all over our healthy, smiling faces.